Dancer was a young kitten living behind a house with 2 siblings and a mama. One sister was captured and brought in near death to the clinic. She was cold and severely anemic from fleas and intestinal worms. When we found out there were two more kittens we advised the owners that they needed flea treatment immediately or they would likely die also. Several days later while we were still treating the initial patient, the family told me (Mimi) that the other two were getting more sick, and that they had done nothing about the fleas. I went after work and caught them and brought them to the Commune. They were so anemic their gums were almost white. Dancer was in better shape than her brother, but she was still quite flea anemic, and quite angry about being handled. I treated them for fleas and intestinal parasites and then just made sure they were well fed with high protein foods and that they were slowly regaining color and staying warm. Both kittens recovered well and while Dasher became fairly social with us, Dancer retained her feral personality. 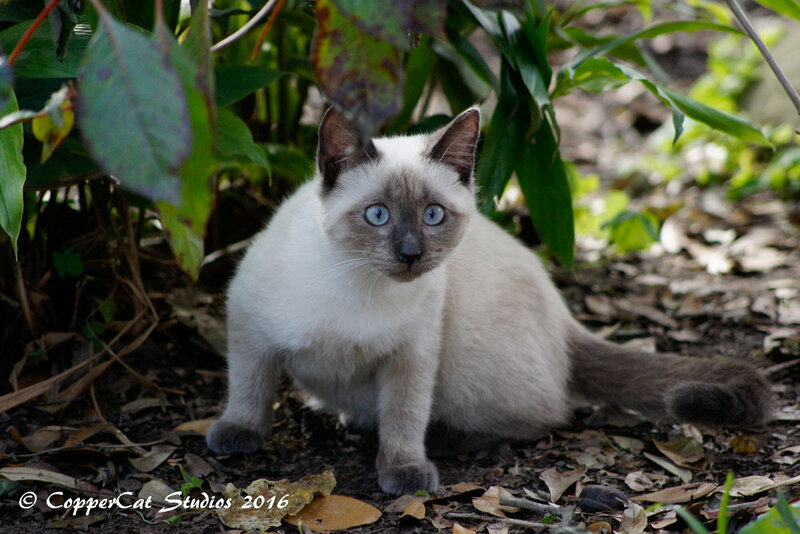 She is an absolutely stunning colorpoint girl, but she will not knowingly let us handle her. Both kittens were handled the same way as kittens, but even Matt’s magic cat hands did not convince Dancer that we were not evil people. We can catch her by slipping up on her at mealtimes, otherwise she just lives her life around us. She seems to be happy, and she is healthy. Other than one bout with an upper respiratory infection, she has had no physical issues, but her fear of people keeps her here at the Commune.